A major seafood producer installing freezing lines had to site four 250 kW liquid ammonia compressors in a product transfer area regularly used by production personnel. Modifying the compressor to control the noise at source was not possible, leaving acoustic enclosure of the installation as the only practicable alternative. The design of the enclosure had to provide rapid access to the compressors for maintenance. In addition, because of the nature and size of the machines, a continuous throughput of air was vital to remove the heat radiated from the compressors and their drive motors, and to prevent the build-up of any leaked ammonia gas inside the enclosure. The enclosure was constructed in acoustic panelling made up of a plain sheet steel outer skin and a perforated steel inner skin. Mineral wool slabs were inserted into the 75 mm wide space between the skins. The outer skins were formed in plastic coated steel to meet hygiene requirements that demanded a corrosion-free, easy-to-clean external surface. The panels were supported on a separate structural frame, free of the enclosed machinery to minimise any reduction of acoustic performance due to machine induced vibration. The overall size of the enclosure was 11 m long x 5.5 m wide x 4.5 m high. 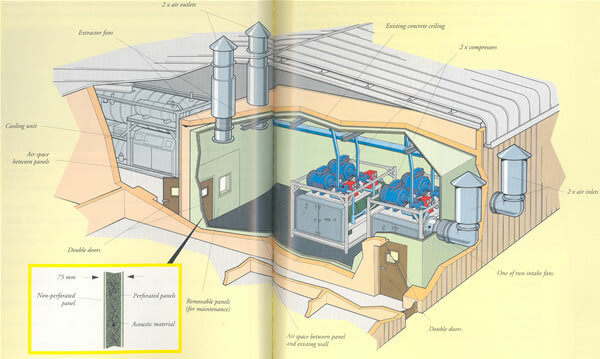 The cooling air supply was provided by four fans each moving some 6 m3/s of air through the enclosure, two drawing in fresh air via an attenuated inlet duct, and two extracting air from the enclosure through a similarly treated discharge duct. A noise reduction of at least 24 dB. Information supplied by Lyons Seafoods Limited. Equipment manufactured and installed by Ian Sharland Limited.